I sniffled and coughed a little as I got dressed this morning. Seems my darling little grandsons may have given me more than I realised for my birthday! I felt a chill in my throat and chest, and went off to get me some warmth. The first thing I grabbed was my pair of black leggings, a wardrobe staple that I’ve lived in most of the past decade of winters, an essential part of my daily winter “uniform”. The cold was getting into my bones with every passing second, so there was no time to waste. I pulled the cupboard door open, and spied a bit of black that I pulled out. Perfect! My black long-sleeved tee went on me in a flash. Great. Warm is coming! And then I stopped. I looked at my wardrobe. Pants were out. I mean, I already had my leggings on. Long-sleeved dress-length shells – choosing one of those would mean my top would have to come off, and that would mean cold, so not happening! Well what then??? I spied my newly made Nita wrap skirt (which I now wish I’d lined – doesn’t slide so well over tights when it’s unlined!) I whipped it out and on it went. Next, my thick black long cardi, and my lovely warm Mahabis on my feet, and I was set. Ah!! I had my knitted little neck scarf from Ireland on, and warm quickly began replacing cold. All good, but I realised that there was a huge hole in my wardrobe – I hardly had any skirts! I’d made a few summer ones – a lovely Colette Patterns Zinnia in a pretty Liberty that is slightly too small for me to wear now – besides the fact that it’s completely a summer skirt! – and a Grainline Studio Moss Skirt that I had to do an emergency (a.k.a. dodgy) resizing take-in alteration on, a couple of summers ago. And of course, I have the Nita skirt I am wearing as I type, but that’s basically it. I’d noticed this little problem last year, and started collecting patterns, but unfortunately, none of them made it onto the cutting table, let alone into my wardrobe. 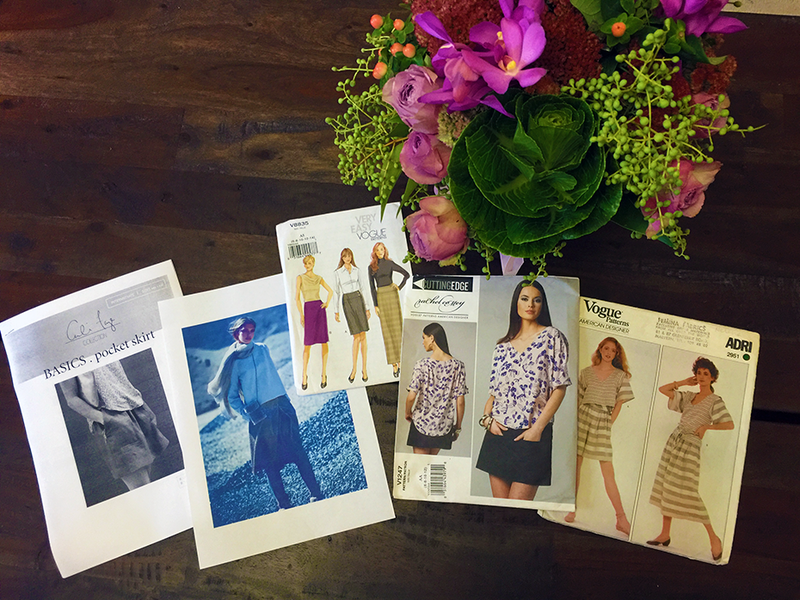 Today, I decided to have some fun with it and create a new project to get me sewing some much-needed skirts – the Utilitarian Skirt Project! I’ve chosen 5 skirt patterns. That in itself took something! I have 39 skirt patterns in my collection, and it was quite tough ruling some out to keep others in for this project. For example, I have some delicious vintage patterns, but they call for a much smaller waistline than I can provide at this point. I did find one vintage pattern I’ve included as a must-sew, but most of my other patterns – vintage or newer – were too this, or too that. Finally, after much deliberation, I chose my patterns. I didn’t just choose my current faves, which would have been possibly an easier task, resulting in quite a lovely selection, but very different from the above. I needed skirts that would be workhorses, that I could wear “to the office”, and out with friends. I looked for lines that flattered a fuller hip figure such as mine these days, and skirts that I’d never feel like I needed to pop the top button, or ease the zip down a tad towards the end of the day. I had another criterion for selecting each of these patterns though. I had to already have the right fabric in my stash for the task, with possibly only lining and notions to purchase. We’re moving out of our house in the next few weeks, and it’s been quite shocking to see the size of my stash as I packed it up. I could stock a whole shop with what I have! So I definitely wanted to be able to use fabric I already had. And then, I created a rule about the process of making my skirts. After I’ve sewn my first skirt, I won’t move onto the next make before checking that I have at least 2 whole outfits I can put together with that first new skirt. So either I’ll find items already in my wardrobe, or if I don’t really have anything that goes, I will have to sew something up, before I can move onto the next skirt. That way, I’ll be building a workable wardrobe, rather than great random pieces that are uncoordinated, and therefore potentially unwearable. This is great because it’ll force me to sew blouses or shirts or tops that will work with my wardrobe as I build it. I know. Not a new concept, but it’ll stop me from my usual approach of seeing something I love on the inter web some place, and making it, without much thought about what I’m going to wear it with. Here are my five skirt patterns. Did you recognise any of them from the sketches above? No. 1: Basics Pocket Skirt, by Cali Faye Collection (no line drawing accompanies the pattern so please excuse my hand-drawn sketch) I can see myself living in this one! I love the big pockets, and it’s not too full around the waist. I’ll make it in a nice dark grey linen I have left over from my Sophie dress. No. 2: Box Pleat Skirt, by BurdaStyle. This is another skirt that will be great to wear either at work in the shop, or out during the day. I have a great piece of remnant wool mix I picked up ages ago, but I’m not sure if it’ll be too thick for that pleat. I’ll check it out, and if it doesn’t look like it’ll work, I’ll use the lovely Woodland Prince linen from Merchant & Mills. No. 3: V8835, by Vogue Patterns. I love this skirt! It’s a cheater’s wrap, so I won’t have to worry about being exposed, and it’ll keep me nice and warm for winter in the dark 8oz denim from Merchant & Mills. No. 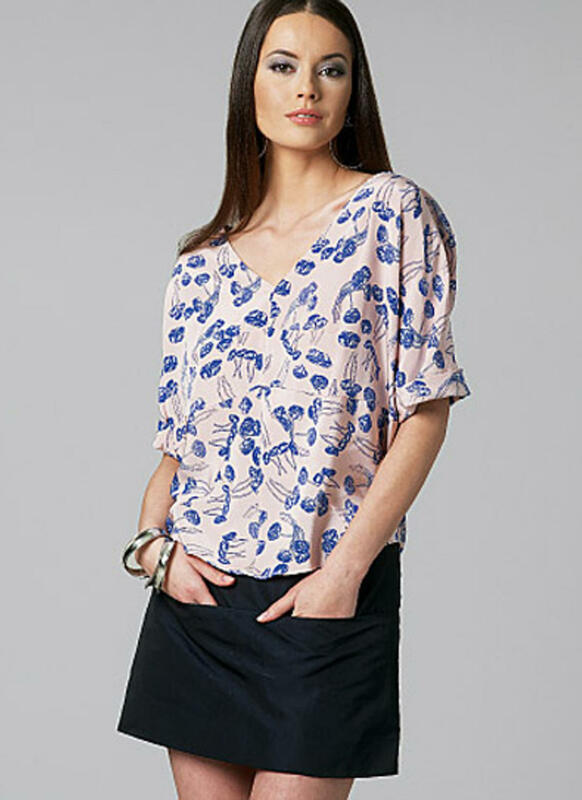 4: V1247, by Rachel Comey for Vogue Patterns. I’ve always loved this skirt. It’s all about the pockets! I’ll make it a little longer, in one of the pieces of lovely linen in my stash. 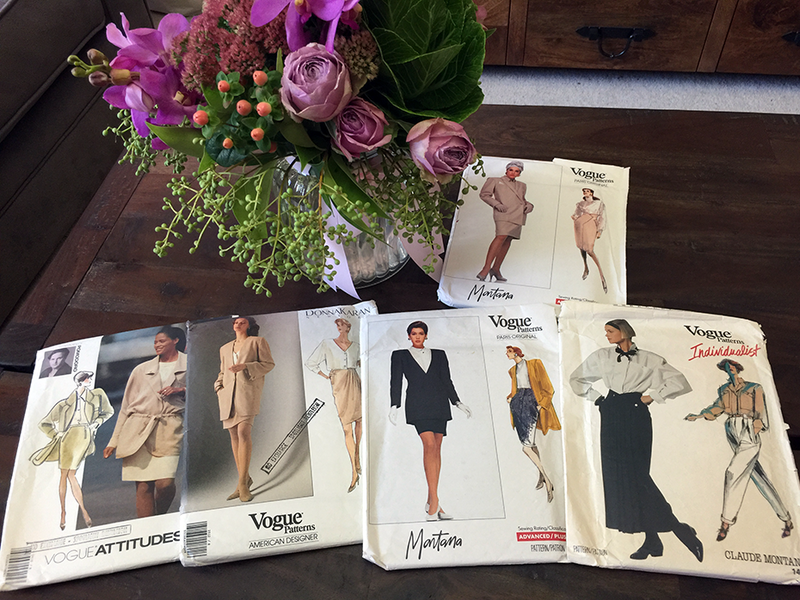 Vogue 2951, a vintage pattern by Adri for Vogue Patterns. I’ve had this pattern for decades, and I’ll (finally!) make it in a beautiful viscose twill I bought from Blackbird Fabrics. Something pretty to wear out. 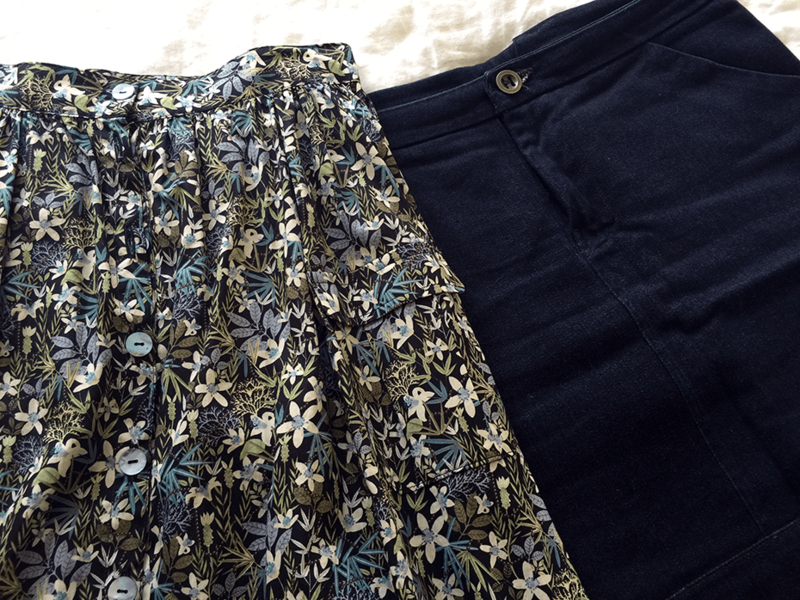 So, now – how do I choose which skirt to sew first! I’d love to hear your thoughts on my project. Have you done something like this before? Are you a skirt-wearing kinda girl? What are your favourite skirt patterns? I might need to create a second list!